In December of 1979 the World Health Organization certified the global eradication of smallpox, a remarkable achievement given that smallpox had killed more than 300 million people in the 20th century. While there are still samples of the smallpox virus in laboratories around the world (along with stockpiles of vaccine), the virus has not been seen in the wild in more than three decades. 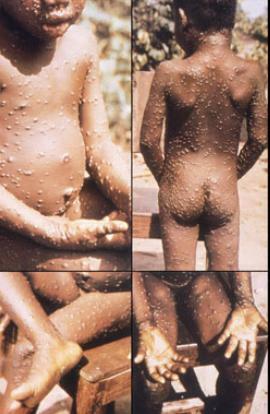 Monkeypox - while a far less deadly illness - is still found in central and western Africa, and it produces a remarkably `smallpox looking' illness in humans. It was first detected (in 1958) in laboratory monkeys (hence the name), but further research has revealed its primary host to be rodents or possibly squirrels, although it is also endemic in monkeys. Human monkeypox was first identified in 1970 in the DRC, and since then has sparked small, sporadic outbreaks in the Congo Basin and Western Africa. Three months ago we looked at DRC: Reports Of A Large Monkeypox Outbreak, and in recent years the number and size of outbreaks has been on the rise. Humans can contract it from an animal bite or direct contact with the infected animal’s blood, body fluids, or lesions, or the consumption of undercooked bushmeat. Human-to-human transmission is believed to occur largely through large respiratory droplets. The smallpox vaccination provides some cross-protection against monkeypox infection, but as a 2010 study in PNAS warned, there has been a Major increase in human monkeypox incidence 30 years after smallpox vaccination campaigns cease in the Democratic Republic of Congo. Routine vaccination against smallpox ceased in the United States in 1972, and worldwide by the end of that decade. Today more than half of the world's population is unvaccinated, a percentage that runs much higher in Africa. Although Monkeypox is normally restricted to small outbreaks in Africa, in 2003, we saw a rare outbreak in the United States when a Texas animal distributor imported hundreds of small animals from Ghana, which in turn infected prairie dogs that were subsequently sold to the public (see MMWR Update On Monkeypox 2003). All of which brings us to a new article in the EID Journal that looks at a large 2013 outbreak of Monkeypox in the DRC that suggests that the virus's epidemiological characteristics may be changing (possibly due to the waning vaccine derived immunity in the community). In 2013, the DRC reported a 600% increase in cases over both 2011, and 2012. The authors also cite a higher attack rate, longer chains of infection, and more pronounced community spread than have earlier reports. I've only included the abstract and some excerpts from the discussion, so follow the link to read this report in its entirety. A 600-fold increase in monkeypox cases occurred in the Bokungu Health Zone of the Democratic Republic of the Congo during the second half of 2013; this increase prompted an outbreak investigation. A total of 104 possible cases were reported from this health zone; among 60 suspected cases that were tested, 50 (48.1%) cases were confirmed by laboratory testing, and 10 (9.6%) tested negative for monkeypox virus (MPXV) infection. The household attack rate (i.e., rate of persons living with an infected person that develop symptoms of MPXV infection) was 50%. Nine families showed >1 transmission event, and >6 transmission events occurred within this health zone. Mean incubation period was 8 days (range 4–14 days). The high attack rate and transmission observed in this study reinforce the importance of surveillance and rapid identification of monkeypox cases. Community education and training are needed to prevent transmission of MPXV infection during outbreaks. This analysis provides insight into the dynamics of MPXV infection. We observed an average household attack rate of 50%, a much higher rate than reported in previous studies. Measures to decrease this attack rate should be implemented, including family-based education related to hygiene and isolation of patients. The transmission patterns observed in this outbreak also suggest transmission at the community level; therefore, community-wide education should begin as soon as the first monkeypox case is identified in an area. The calculated incubation period of 5–13 days further refines our understanding of the longest period of MPXV transmission risk after exposure in a natural setting. Knowledge of transmission risk is helpful for considering the appropriate monitoring period for exposed persons. This investigation and future work will improve our understanding of MPXV infection and our ability to limit its spread. Dr. Nolen served as an Epidemic Intelligence Service officer during this investigation, working in the Bacterial Special Pathogens Branch, Division of High-Consequence Pathogens and Pathology, National Center for Emerging and Zoonotic Infectious Diseases at CDC. She currently works in the Field Epidemiology Training Program. Her research interests include the public health effects of infectious diseases.